So, after a few readers asking me about how to make Elsa's hair. 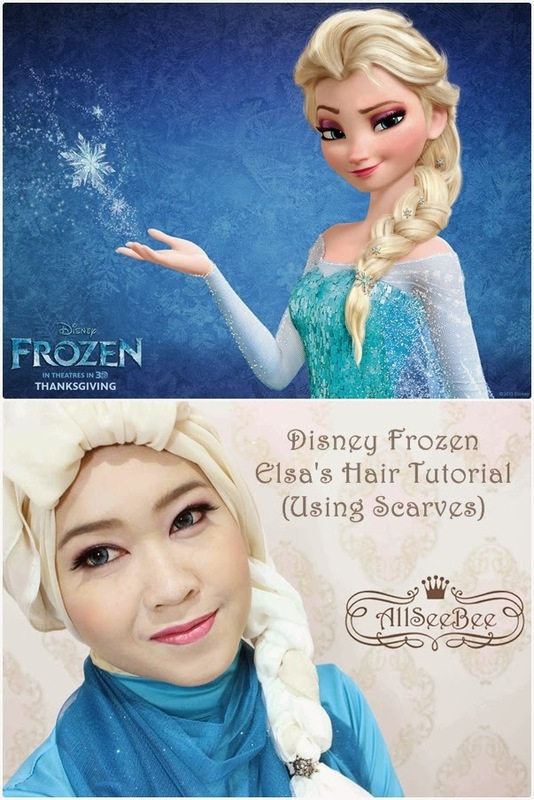 Here, I present you the tutorial on how to make Elsa's hair out of scarves. Please don't mind my yellowish face in the tutorial. I tried new foundation and it turned out to be too yellow for me and it was too late to redone my makeup. This is how it looks from side to side. I hope that this helps you and I hope that the tutorial clear enough to describes every step. This Elsa's hair is super easy. I mean it! Super easy! Oh yeah if you want to know how to create Elsa's makeup you could visit my post Disney Frozen - Elsa - Makeup Tutorial. Ya alloh sulit kaliii dhilaa.. tapi boleh dicoba.. kereeeen dirimu..
Bikin tutorial hijab ala anna's hair jg dong. please... thanks before say. tutorial ini mau d coba dl.